Conflict and violence continue to plunge the world into greater disorder and as the world becomes more sophisticated in its technology the ability to maim and destroy reaches catastrophic proportions. Voices of peace must now be given the platform to be heard louder than before in order for peace to take hold. Inspired by the courage and relentless pursuit of peace by former Malaysian Prime Minister Tun Dr Mahathir bin Mohamad this Mahathir Award for Global Peace has been created to provide the platform for recognition of exceptional individuals and organisations that have clearly demonstrated intellectual courage, stamina and determination in the global struggle against the escalation of violence and conflict. 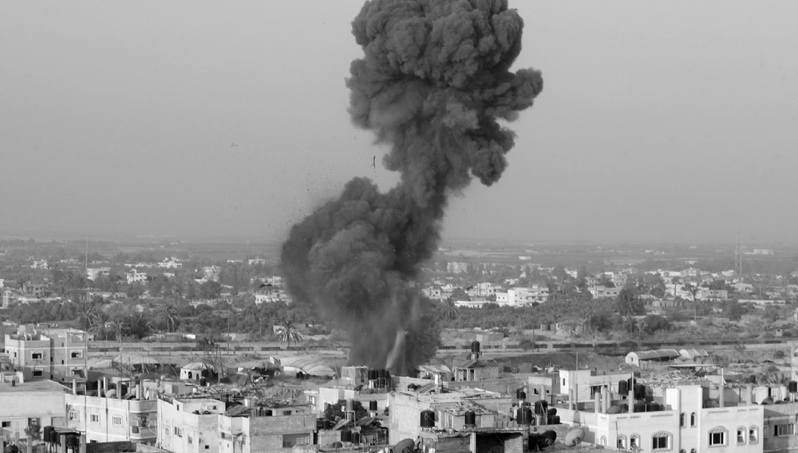 The seeds for peace have long been sown by those who have foreseen the destruction that conflict and violence will exact on generations of people. But now the survival of Mankind itself is being threatened because the power to destroy has grown in mag- nitude. It is upon this mindset that the Mahathir Global Peace Foundation places the urgency of its mission. There can be no compromise as peace can have no other alternative. Peace is our only means of survival and every other species on Earth is dependent on our ability to overcome those who see war as an option. Across the world scores of peace-motivated organisations are working in isolation to address issues that impact people in all stations of life. Men and women of remarkable fortitude, creativity and innovation struggle to bridge differences, overcome suspicion, and address social as well as cultural gaps to bring about a state of peace in the lives of people. These are people who often put their own lives in danger as they speak out against war and work towards peace. The Mahathir Global Peace Foundation seeks to strengthen through consolidation all these efforts of individuals and organisations so the global voice for peace is loud and clear.It seeks to be the engine of global peace to protect the rights of people. The establishment of the Mahathir Global Peace Foundation enables an unprecented outreach to youths from across the world. The Foundation has the means to reach 222 countries and territories through its website to engage the hearts and minds of the world's next generation of movers and shakers. Grassroot movements to press for peace through co-ordinated non-violent programmes and sustain the momentum till it becomes pervasive and universal. The co-operation of governments, legislators and leaders of the world to enact laws that will support a new education that focuses not only on academic and technical studies, but also on the nurturing of individuals to serve the community, country and the world. Promote initiatives that encourage dialogue and cooperation between organisations in different countries that will create a global network to reduce differences and misunderstanding. Collaborate with media groups to advocate and disseminate information to promote a culture of peace. Identify and promote common grounds that will advance peace around the world as the way forward. With this award we seek to strengthen the initiatives undertaken by individuals and organisations around the world and escalate the momentum for peace efforts. 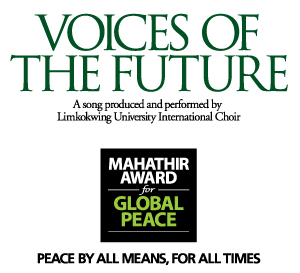 The award reflects the courage and convictions of Tun Dr Mahathir bin Mohamad, a global icon for peace, who speaks for millions unable to voice their opinions but who stand against violence. The award provides support for individuals and organisations selected to continue their struggle for peace. The award will be made on an annual basis. A world where people live their lives in dignity and peaceful co-existence; where no one goes hungry and every child has access to good education; where every issue is solved through mediation and negotiation; where violence is abhorred and never a means to settle differences. To encourage and support the efforts of individuals and organisations that are proactive in peacemaking endeavours between nations and within communities. The underlying intention is to build a strong and cohesive global movement nurtured to become immensely effective in ending armed conflict and violence of any kind, anywhere on Earth.